Is coastal erosion bad or wrong? I recently had the pleasure of visiting Granity on the West Coast of the South Island. We had a taste of the wildness that the West Coast is famous for and also experienced the most beautiful fine weather and walked up the most apt named Charming Creek. The creek and tributaries were vibrant and active with the previous day's wild weather. I met up with Phil Perrott who attended our conference in Christchurch earlier this year. Phil owns the tavern and accommodation Miners on Sea. I spent an afternoon with Phil visiting different parts of the coastline along Granity and north at Hector. We observed various responses to the retreat of the seashore; rock revetments, gabion baskets, timber retaining walls and fences, reno mattress, sand push ups, car bodies, old mining carts and, to my pleasure, native plants. Due to the West Coast's high annual rainfall harakeke grows right up to the high tide zone and provides an excellent buffer against coastal storms. The beach appears to be predominantly gravel with a small fraction of sand and I wondered whether sand binding plants would make a difference here. Then I discovered a patch of marram surrounded by sand which got me excited with the possibilities. Phil's restaurant and accommodation are very close to the sea. In the future if erosion does threaten these buildings they are designed to be easily removed. His beach front is entirely managed with plants in stark contrast to the neighbouring areas. He has been furiously planting harakeke and, since our conference in Christchurch, he has planted pingao and kowhangatara and it will be very interesting to observe this beach over time. The situation at Granity and Hector reflects the nationwide context: Around the country there are a myriad of responses to the phenomenon called coastal erosion and almost all are within the paradigm coastal erosion is bad or wrong. Our challenge is transforming this paradigm to coastal erosion is a natural phenomenon and then really start to manage our coasts in a natural way, working with natural processes rather than against them. 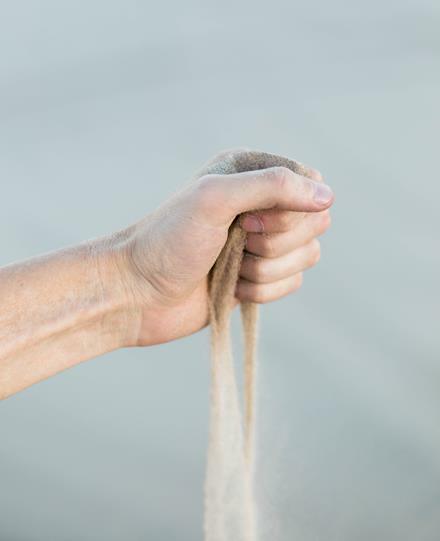 Allowing shorelines to move with the short and long term cycles. We are excited to announce the venue and dates of our next conference. It will be held in Petone on Wednesday-Friday 21-23 March 2018. It is likely that we will also have a fieldtrip to the Wairarapa on Saturday the 24th. Put these dates in your diaries and book your travel and accommodation now. 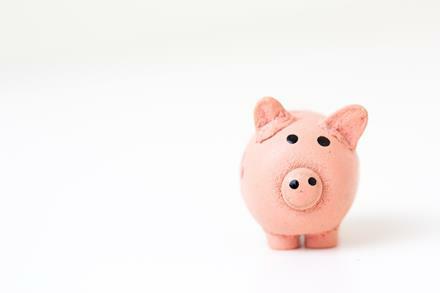 If you book through KiwiKarma you can donate a proportion of your payment to us. We look forward to seeing many of you there to hear about coastal restoration news from around the country and explore the Wellington region's coasts. Keep an eye on our website for details as they develop. Our chair recently introduced us to the movie Sand Wars. It is not very new (2013) but many of you may not have seen it. Public copies have disappeared off the web due to copyright issues. Here is a TED talk about it from the director. Here you can pay to see or buy it. Just after our last newsletter was sent out we received news that our application for funds to the Community Environment Fund (MfE) was approved. 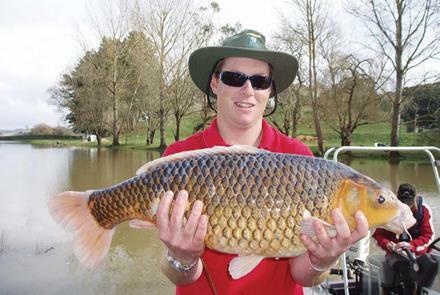 We are working with Waikato Regional Council to turn pest fish koi carp into useful fertiliser pellets and maybe even pest repellents and/or pest bait. Read the full story. In the meantime we have already reported to MfE for the first milestone. 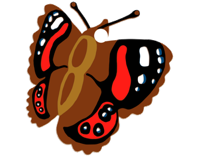 Nature Space is a website where groups can enter their activities, especially in numbers. Their home page lists: square metres of weeds controlled, possums eradicated, threatened species planted, plants in the ground, and active group members. 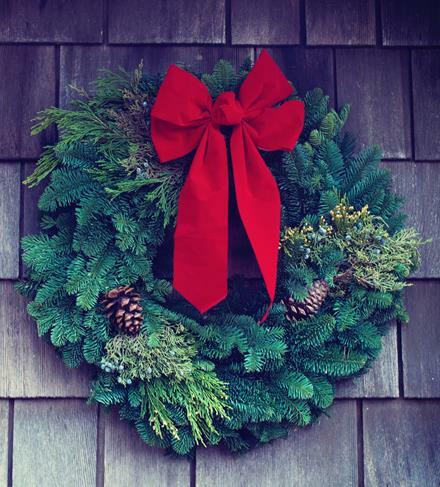 Sign up here if your are interested to add to the tallies. Similar to Nature Space in that it counts things, but this one is just about trees. Join here if you want to add your numbers. 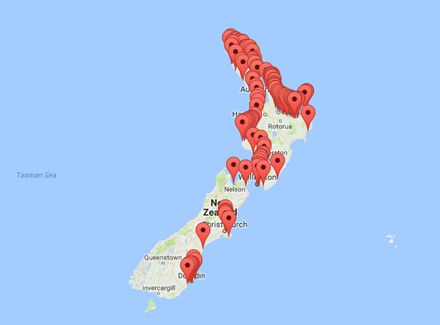 On the NatureWatch NZ website, you can record your observations, explore other people's observations, learn about species, join (or create) projects, find (or create) places, use (or make) species guides, and find and follow people. And, of course, add observations. The iNaturalist app can be used to upload photos and details in the field. You can then ask for identification and/or identify your own and other people's finds. • NZ has a diverse lizard fauna and most lizard species are threatened with extinction. • Their main threats are predation by introduced mammals and habitat loss. Most of the remaining habitats for native species are small, isolated and often plagued by pests. • Lizards can be found in a range of coastal ecosystems, including fore and back dunes, estuaries, coastal forests and rocky shores. • Coastal restoration projects can easily enhance habitat for lizards while carrying out other activities- you might already be inadvertently restoring lizard habitat! Planting a variety of native grasses and shrubs creates habitat for lizards and their prey. • Other activities that help lizard populations recover are placing driftwood and seaweed ‘cleaned’ off the beach and placing it above the high tide line, controlling pest mammals and planting dispersal corridors between large patches of habitat. A more detailed article is on our website. Thanks to Moniqua Nelson-Tunley of Waikato Regional Council for this important and useful information. Keeping our website up to date is an ongoing job. We are in the process of updating the Coast Care pages on our web site. Would you mind checking your group or groups to make sure all the details are still correct? That would be much appreciated and might get you extra volunteers! Check here to find the details that we have of your group. 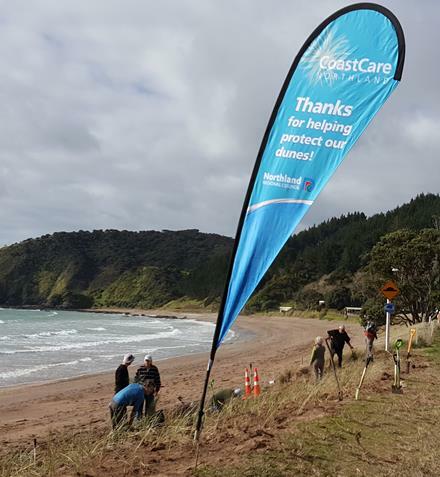 CoastCare Northland dune planting is complete for the year with 12,600 dune plants planted at 18 sites around Northland. 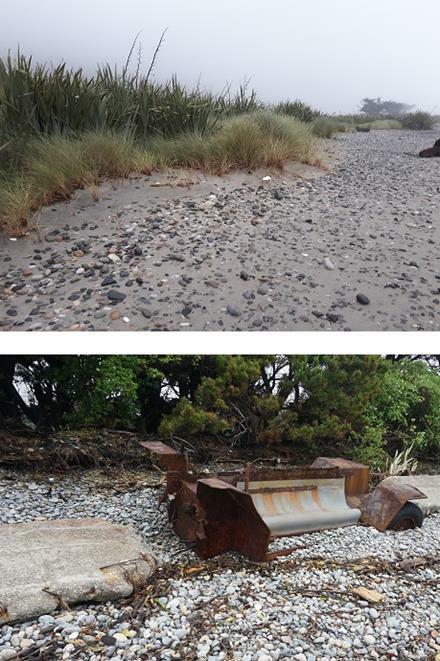 In September planting took place at Hukatere, Paraparea (Whananaki North), Ahipara, Ruakākā and Tern Point (Mangawhai sandspit). This includes several sites where mechanical reshaping has been undertaken to remove exotic vegetation and fill prior to planting with native sand-binding plants to enable the dunes to function more naturally. One of these sites is Long Beach, Russell (photo), where dune restoration has taken place over several years to gradually reshape the kikuyu bank and restore a spinifex dominated foredune. 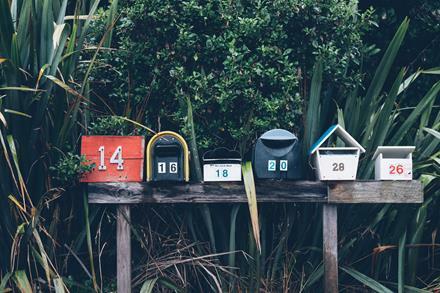 We would be sad to lose touch with you, so please let us know your new email address. Our trust relies on a lot of volunteer work but some funds are essential for successfully running it. Costs of website maintenance, domain names, internet, skype, accounting, administration etc. etc. need money. We provide our information for free for everyone to use and would like to continue doing this. If you feel we deserve a little donation for this please do so here. For most individuals such a donation will entitle you to a tax credit of 1/3 of your amount donated. 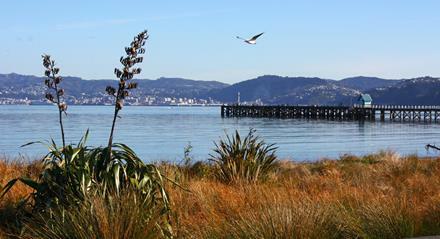 Wishing you all wonderful holidays, happy times at the beach or wherever you choose to spend your time and we look forward to seeing many of you in March to explore the coastal environments around Petone and Wellington.